UNISON has always given its members the choice of opting in to its affiliated political fund, that gives them a say in the democratic processes of the Labour Party, or of opting in to the General Political Fund, independent of any political party. For those members that choose to opt into the affiliated political fund the following will be of interest and we introduce the Branch Labour Link Officer, Francesca Brennan. Francesca was delighted to be elected as Labour Link Officer for Inverclyde UNISON at the Branch AGM and is looking forward to strengthening connections between the UNISON branch and the local Labour party. 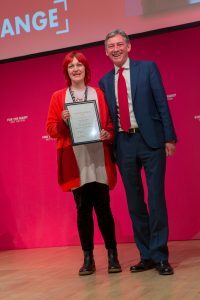 She has worked in local government for a number of years in libraries in Glasgow, East Lothian and Edinburgh before returning to Inverclyde Council in 2012. She is passionate about how libraries can empower communities and loves their capacity to give local people access to information, enjoyment and social contact. Library staff work so hard for service users and she was really appreciative of her colleagues who nominated her for this Branch Officer post. For the past two years, Francesca has been the Women’s Officer for Inverclyde Constituency Labour Party and has used this role to develop women’s representation and activism within the party. She was part of the inaugural Scottish Labour Future Leaders Programme in 2017/18, which gave Francesca the opportunity to work with leading campaigners and organisers and is pictured above with Scottish Labour leader Richard Leonard. She has particularly enjoyed organising events with local Labour party members e.g. the Great Get Together which was inspired by the life of the late Jo Cox MP. Francesca lives in Greenock with her husband and children. She combines her work, family life and her political activism which has given her some insight into the challenges that face the many Inverclyde families who juggle a range of complex commitments. As Labour Link officer, she will she will do her best to take UNISON policy forward and encourage joint work and campaigning within the local Labour party. She will also be a key point of contact for matters of joint interest to UNISON and the local Labour party. Any members who would like to find out more about the Unison Labour Link please contact Francesca at the Branch Office on 01475 715900.